Registration requests are not complete until fees are paid. 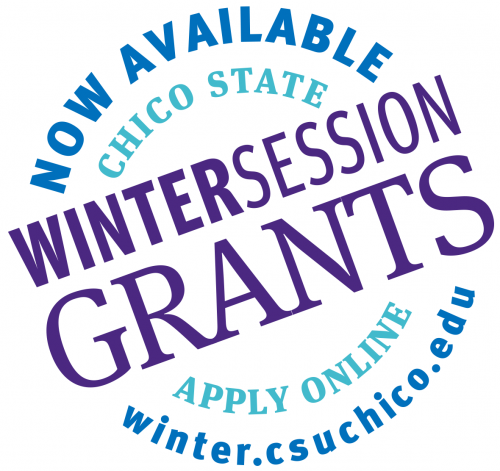 If you are admitted beginning in Spring 2020, email Continuing Education or call 530-898-6105 to enroll in a Winter Session class prior to submitting your grant application. Note: Winter Session Grants apply only to Winter Session per-unit fees and may not be used toward past debts, spring fees, etc. Only one grant may be awarded per student. Register for the Winter Session class you need. Complete the online application form that will be available on this page. Continuing Education will confirm your eligibility and notify you of your grant status. After you've been notified, pay fees due to complete your class registration. * The CSU makes every effort to keep student costs to a minimum. Fees listed in published schedules or student accounts may need to be increased when public funding is inadequate. Therefore, CSU must reserve the right, even after fees are initially charged or initial fee payments are made, to increase or modify any listed fees. All listed fees, other than mandatory systemwide fees, are subject to change without notice, until the date when instruction for a particular semester or quarter has begun. All CSU listed fees should be regarded as estimates that are subject to change upon approval by the Board of Trustees, the Chancellor, or the Presidents, as appropriate. Changes in mandatory system-wide fees will be made in accordance with the requirements of the Working Families Student Fee Transparency and Accountability Act (Sections 66028 - 66028.6 of the Education Code).